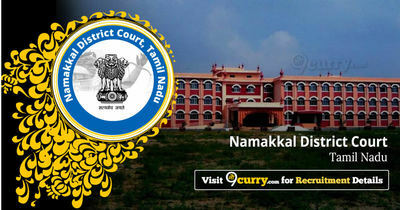 Namakkal District Court Recruitment 2019: Namakkal District Court, Tamil Nadu is conducting recruitment processes to fill 59 vacancies. As of now, there are two recruitment drives going on for 57 Office Assistant, Computer Operator & Other Posts and Office Assistant Posts. Namakkal District Court Recruitment 2018 - Job notification for 15 Posts under Criminal Unit in Namakkal, Tamil Nadu. Applications are invited by Namakkal District Court, Tamil Nadu on or before 31 Jan 2018 till 5:30 PM for 15 vacancies. Namakkal District Court Junior Administrative Assistant (Computer Operator) & Office Assistant Recruitment 2017 - Job notification for Junior Administrative Assistant (Computer Operator), Junior Administrative Assistant & Office Assistant Posts. Applications are invited by Namakkal District Court, Tamil Nadu on or before 27 Nov 2017 up to 5:30 PM for 5 vacancies. Namakkal District Court Computer Operator, Office Assistant & Other Posts Recruitment 2017 - Job notification for 52 Computer Operator, Office Assistant, Senior Bailiff, Junior Bailiff, Xerox Machine Operator, Record Clerk, Masalchi, Night Watchman, Sweeper Posts in Tamil Nadu. Applications are invited by Namakkal District Court, Tamil Nadu on or before 20 Nov 2017 for 52 vacancies.